During the last two weeks, as the valley soaked in cold air, the temps at Bogus Basin have been warm, and arguably "balmy". Several BSU snow researchers have been feverishly preparing snow study sites, setting-up perimeters ropes, setting bamboo poles, transporting and testing instrumentation, and digging many benchmark snowpits. Of course, there are perks with this research job since we get to do some skiing as we move between snow study sites. Deer Point Express during mid-January, as we head to snow study sites. Views to the South East from Deer Point - Inversion weather, warm air above cold stale air in the valleys. Under the leadership of Hans Peter Marshall, a charismatic BSU Geophysics professor, this team of cryosphere researchers and students are advancing snow science in Boise. Our leader, HP (Hans Peter) testing radar equipment last fall at Bogus Basin site. BSU's Geoscience and GeoPhysics snow research work has made it already to prestigious conferences such as the well recognized International Snow Science Workshop (ISSW). The Boise State University Snow scientists not only conducts research in the Boise campus and Bogus Basin, but also has various snow study areas across SW Idaho, Colorado, Austria, Canada, and South America where cutting edge experiments and fundamental snow physics investigations are conducted, in progress, or planned. So, what is a cryosphere scientist? Next, I include an excerpt from Wikipedia, that enlightens us. Basically, a Cryo researcher investigates the science of frozen water. Frozen water can be found as seasonal snow cover, but also as glaciers and permanent snow fields. BSU's Cryo team is chracterizing snow stratigraphy (layering) with various radar technologies, infrasound detectors for avalanches, chemical and isotope characterization of snow, near-infrared snow imaging, impact of grain type/density on IR thermography, water movement in the snow, as well as other snow research opportunities. Lysimeter in place at Bogus Basin Study Site - tipping water buckets are used to measure water flowing under the snow. Upward looking Ground Penetrating Radar that track snowpack stratigraphy through the season. Skiers and Riders driving up to Bogus Basin have seen the hydrological station below tree-line, but there are other sites at Bogus Basin Ski Resort where the secrets of science are being unveiled! Most of the experiments required high-tech devices, making the tasks interesting but challenging due to the complexity of some of the equipment. BSU Geophysics main snow research plot - where radar, soil moisture and large area water balance experiments are conducted. Views of Idaho Mountains from Bogus Basin main snow study site. But research activities also require plenty of snowpit work, where hardness profiles, near infrared spectrum imaging, infrared and thermocouple based temperature profiles, snow crystal characterization (type and size), and snow densities are meticulously recorded. Samples of snow are collected as well for mass spectography isotope and chemical analysis. Snowpit at a side-country snow study site. Side-country snow study site with "low-tech" snow height stake. The research conducted at Bogus Basin is essential for advancing radar technolgies that will allow to estimate "snow water equivalent" over large geographical areas. 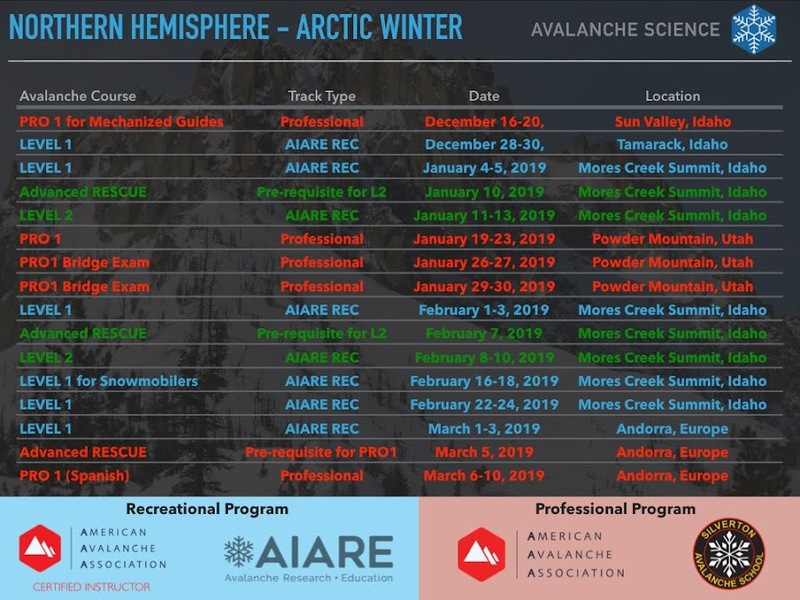 In addition at Bogus Basin snow science experiments conducted by the Cryo Team are meant to improve avalanche forecasting for Idaho department of Transportation, as well augmenting snowpack fundamental understanding to be leveraged by our local area backcountry avalanche forecasters. For our community, the BSU Geosciences Graduate department, and Cryo Team to be successful we REALLY need your cooperation by not disturbing the snow at the various snow study sites. We count with your support to remind your friends about the importance of snow research at Bogus Basin, We are certain that you can be a positive force by persuading fellow skiers to stay-off within the perimeter of Bogus Basin snow study sites. Tracks by unknown skier that crossed rope and skied within the snow study site perimeter. If you see us around by any of the Bogus Basin snow study sites, please feel free to ask us for a tour. We will be happy to share with you the work we are doing. Our snow observations are not only limited to snow sites in the mountains of Idaho, Colorado, Austria, Canada and South America, but we are also intrigue by snow metamorphism right out of our homes in Boise. The cold temps during the last weeks resulted in faceting of the snow cover in the Treasure Valley. Check the pics for facets at Warm Spring Mesa neighborhood.